Australian Shepherds are another type of herding dog which was successfully developed for ranch work in the western section of the United States. Although they have the title of Australian in the breed name it was in no way developed in the country of Australia. The name was merely assigned to this breed of dog as a result of the Australian sheep herders preference for them when they arrive in America in the early years. These Shepherds quickly gained in popularity upon the end of the Second World War. It was their work involving horse shows, rodeos and television which promoted the breed the most. Although they initially were prized for their herding abilities by the ranchers they have progressed to other roles in life as a result of their versatility and high intelligence. They are a breed which is eager to please their owners and possess a great ability to obey their owners every command. This dog has a high energy level and needs to be kept busy in order to stay out of trouble. They particularly enjoy playing games with their owner such as catching balls or Frisbees. They have been continually praised as a search and rescue dog with many of them being honored with metals and ribbons. Their current list of occupations include not only the search and rescue tasks but also drug detection dogs, disaster search dogs or as guide animals for the blind. This breed of dog can have a variety of general appearances. 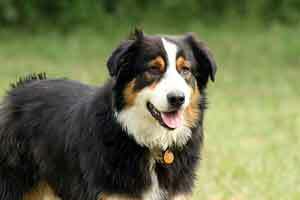 The color variants include black tricolor, blue merle, red merle and liver tricolor. As with many other dog breeds the appearance is a major factor in what type of dog you are obtaining – either a show dog or a working animal. The working dog has a tendency to have a thinner, shorter coat and may be smaller in size then the show dog. The dogs regardless of their use are generally approximately 23 to 24 inches high. Here is a bit of interesting trivia concerning these wonderful dogs. There is such a great variety in their eye colors that you can readily find dogs with eyes of green, amber, hazel, blue or brown. They may even have eyes of two different colors or what is also called bicolor or split eye where the dog’s eye could be half blue and half brown. They are perhaps the only breed where variations in eye color are completely acceptable for the breed standards as established for show dogs.